A mere 105,097 people call it home, but to those 105,097 individuals, there’s no other place they’d want to live than Carlsbad, California. On an acre-for-acre, dollar-for-dollar basis, Carlsbad residents and its guests enjoy some of country’s best shopping, dining, and entertainment experiences its city planners and its businesses have worked so hard — for years — to build. 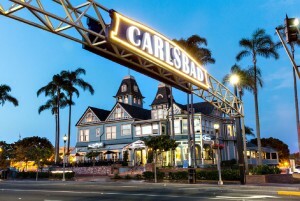 It’s not hyperbole to call Carlsbad a superior small city either… a city that’s managed to retain its small-town feel, by the way. Incomes are 50% higher than the U.S. average, and the population is plentiful between the ages of 35 and 55. The convergence of higher incomes and a wider-than-average swath of the potent 35 to 55 demographic have allowed small businesses of all types to thrive. This proverbial perfect-storm has been especially kind to Carlsbad’s restaurant scene, with every fare from pizza to seafood to fast casual well represented among the area’s favorites. While seafood is going to be an obvious focal point for any coastal town, surprisingly enough, Carlsbad is also home to some incredible pizza venues. Bressi Ranch’s Pizza Port is one of them. Located just a few blocks from the beach in the center of town, Carlsbad’s Pizza Port lets patrons design their own pizza from the dough-up, and wash it down with the Pizza Port’s own micro-brewed beers. Pizza fans, though, absolutely can’t afford miss Crust Pizzeria at 3263 Camino De Los Coches, just off Rancho Santa Fe and within walking distance of Lower Stagecoach Park. “Fresh” is the name of the game at Crust Pizzeria. Hand-tossed dough is made in-house, daily, as is the vine-ripened tomato sauce. Ditto for the veggies, and the meat and cheeses used in its New York style/West Coast flair pies are nothing but the best — executive chef Charlie Meola wouldn’t have it any other way. And with more than 40 years of pizza-making experience under his belt, he’s more than qualified to know. Of course, making pizza isn’t just a learned process. In fact, making great pizza isn’t a process at all. As Meola explains, “Creating high quality pizza is not best learned in an empirical way,” referencing his view that it’s more of passion than a science. One taste of the food at Crust Pizzeria is all it takes to know he’s passionate about getting it right. And if pizza isn’t on your palate, Bistro West, located at 4960 Avenida Encinas, serves up traditional American fare like chicken pot pie or a New York strip steak that’s to die for, all served with vegetables planted, grown, and harvested on the chefs’ owner three-acre farm. Of course, if you’re just looking for a cold and creamy treat to cool off after some time at the beach, Gaia Gelato at 300 Carlsbad Village Drive can’t be beat. It rotates dozens of unique flavors of gelato, and every single one of them tastes like a bite of Italy. There’s more to do in Carlsbad then enjoy its fantastic pizza, seafood, and gelato, of course. For the kids, one of the only two Lego-themed amusement parks found in the United States calls Carlsbad home. And for the adults, The Flower Fields is a flower garden found on the Carlsbad Ranch, offering stunningly beautiful views. The Flower Fields is only open from early March to mid-May, though, so plan accordingly. The Sea Life Aquarium — part of the LEGOLAND venue — is fascinating for kids of all ages. Carlsbad’s beaches are also second to none…. all seven miles of them. Fun all year ’round, beach-goers can find a stretch of sand as quiet or as crowded as they like. South Ponto Beach, by the way, is a lagoon, avoiding the bigger waves and some of the sun-seeking crowds. It’s also family-friendly in that it’s one of the few public beaches with restrooms. Whether you’re enjoying a slice of pizza at Crust Pizzeria or soaking up the sun at South Ponto Beach or being a kid again at LEGOLAND, there’s no doubt Carlsbad is a great place to visit as well as a great place to live. Some would even say California’s best-kept secret is a little slice of heaven.